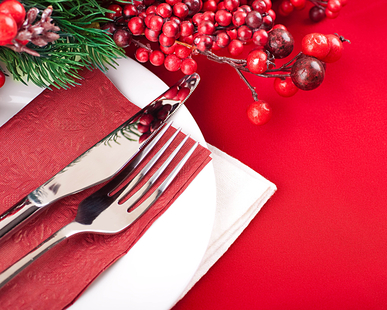 Looking for a restaurant in Amsterdam that is open on Christmas Day and Boxing Day (Tweede Kerstdag to some of you!)? DutchNews.nl’s favourite food blogger Amsterdam Foodie – aka Vicky Hampton – has some suggestions. I’ve not eaten at Floor17 (although I know a man who has: check out Dutchified’s video) but I have had cocktails at Floor17’s bar. And one thing’s for certain: whatever you think of the food, the view (from 17 storeys high) is amazing. This year, chef Richard Matulessy has put together a 7-course Christmas menu for your delectation. Last year, I had a very nice dinner at Bluespoon, which is good news because the Andaz Hotel’s restaurant is serving up family-style Christmas brunches and dinners on December 24, 25 and 26. French meets modern Dutch at this popular high-end kitchen and dining room in de Pijp. Chef Jasper is serving a 6-course Christmas menu, including scallops, duck-liver pate and pork belly, while sommelier Tim can recommend a wine pairing to match. I’ve had literally no experience of Carter whatsoever, but Iens tells me they’re serving classic Christmas dishes with a modern twist: ravioli with smoked mozzarella, venison with sprouts, mackerel, oysters and chocolate desserts. At €42.50 per person, it’s the cheapest of the bunch, too. Beef, pumpkin soup and mackerel tartar are all on the menu on Christmas Eve and Christmas Day at De Palmboom. The Boxing Day menu takes a similar format but courses are different (they still look seasonal and fairly meaty, however). I’ve never eaten at De Palmboom, but its central location looks handy for visitors to Amsterdam. I’ve only eaten at Envy once and I was none too impressed with the diet-sized portions and sullen service, so I never went back. But that was a long time ago and they’re still going strong, so maybe they’ve improved. On Christmas Day and Boxing Day, they’re serving a five-course dinner, and on Boxing Day only (Dec 26th) they’re serving lunch too. Mazzo is keeping it Italian with a Christmas menu featuring antipasti to start and Panforte with Vin Santo sabayon for dessert (the main in the middle looks more traditional). On Boxing Day, they’re also serving an antipasti-led brunch, so it’ll be Buon Natale all round. I’ve eaten at Mazzo and it wasn’t a great experience (are you starting to see a theme in my opinion of these IQ Creative restaurants?) but it seems to be popular so what do I know? This feature was first published on the Amsterdam Foodie blog. The cookbook, Vicky Hampton’s Working Lunch, makes a great Christmas gift as well.